Gov. Aminu Masari of Katsina State has expressed concern over the rampant cases of encroachment of cattle routes, grazing and forest reserves in the state. Masari spoke on Thursday in Katsina at the opening ceremony of a stakeholders’ meeting on the menace of “Forest Reserves/Cattle Routes Encroachment’’. “The state is currently experiencing indiscriminate convert of cattle routes and grazing reserves into farmlands by influential people and farmers. “The state government is aware that several people have converted the cattle routes and government forest reserves into their farms. “The encroachment of the government reserve forest and the cattle routes are the sources of conflict between farmers and cattle breeders in the state. “The state government decided to organise this meeting with a view to finding solution to the menace of encroachment into the forest, grazing reserves and cattle routes,” he said. 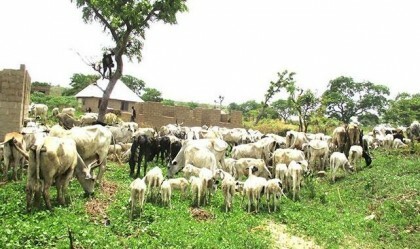 Earlier, Alhaji Abdul-Aziz Kofar-Sauri, the Chairman, Committee for Peaceful Co-Existence between Farmers and Cattle Breeders, said that over 500 people in 34 local governments had encroached into the cattle routes, grazing reserves and forests. “Our committee has uncovered that over 500 persons deliberately encroached into the places and converted them into farms illegally. “We have ejected over 200 people from the illegal farms and to our surprise, they have returned into the ejected farms,” he said. In his remarks, the Chairman, Civil Liberty Organisations, Alhaji Bashir Ruwan-Godiya, called on the state government to take drastic action against the offenders. “We are aware that prominent people are behind the syndicates that caused encroachment into the government forest reserves and cattle routes. “If this people are punished by the government, the common man will not even attempt to commit similar offence,” he said. In his contributions, the District Head of Bakori, Idris Sule Idris, appealed to the state government to give traditional rulers the chance to eject those that encroached into cattle routes and grazing reserves. Idris said that the menace had been causing unnecessary death of many people anytime there was clash between farmers and pastoralists in the state. The Katsina State Government had managed to dismantle the syndicate of cattle rustlers disturbing the cattle breeders and farmers in the state.